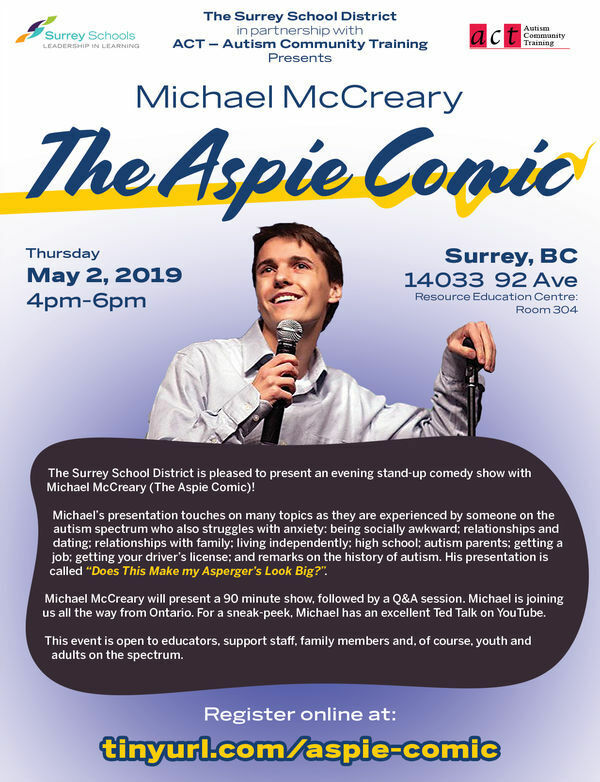 The Surrey School District is pleased to present an evening stand-up comedy show with Michael McCreary (The Aspie Comic)! Michael’s presentation touches on many topics as they are experienced by someone on the autism spectrum who also struggles with anxiety: being socially awkward; relationships and dating; relationships with family; living independently; high school; autism parents; getting a job; getting your driver’s license; and remarks on the history of autism. His presentation is called “Does This Make my Asperger’s Look Big?”. Michael McCreary will present a 90 minute show, followed by a Q&A session. Michael is joining us all the way from Ontario. For a sneak-peek, watch the video below of Michael at TEDx. This event is open to educators, support staff, family members and, of course, youth and adults on the spectrum. This entry was posted on May 2, 2019 by Events Manager.